Carlos Vassallo, CEO, LatinVision Media Inc.
As always, those links go to their speaker profiles so you can check them out and assure yourself of their qualifications. Mike Grehan starts us off explaining that SES first tried to tap into the Latino market with SES Latino in Miami. The beach was great but no one got any business done. So now they’re trying again with a single track in one of the major shows. Even though LA is the place for reaching the Hispanic population-wise, they decided on New York. Carlos Vassallo tells us that he gave up breakfast with the Argentinian football team to have breakfast with us. Dude, no one would have blamed you for bailing. He welcomes us to the track. Carlos Manzano explains why New York is happy to have us here and that it’s the most diverse Latin population. Basically, rah-rah New York and Latino = BFFs. There are a million introductions to this thing. Can we get to the actual keynote please? Manzano introduces Mark Lopez and Paul Lima. Paul takes the mic next to introduce Mark Lopez. Oh heavens. The room is broken about half and half between people looking to do business in the US to Hispanic markets and people looking to expand internationally. Finally, Mark Lopez steps up. He’s mostly talking about the US Hispanic audience. Demographically, it’s growing rapidly, reaching 100%+ by 2040. In order to understand and measure your ROI, you need to consider all the levels that brought them to you. Search should be a complement to offline media. They do a lot of off-line marketing on television and radio. TV is a trigger for search. 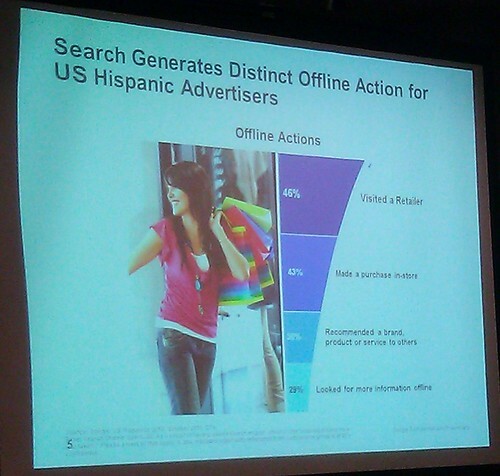 78% of Hispanics have used a search engine for find m ore information on something seen on TV. 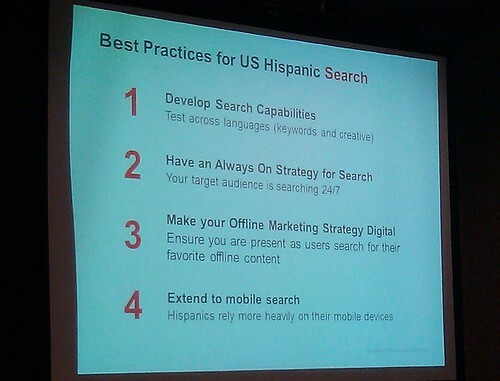 93% of US Hispanics use Google as their primary search engine. 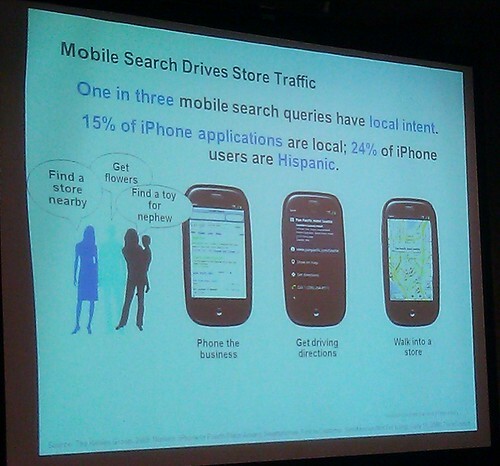 Mobile search is big with US Hispanics, having leapfrogged the general market. 24% of iPhone users are Hispanic because it allows them to stay in touch with friends and family. Over 40% compare prices and locate retailers via their smartphones. It’s an important funnel for the market. Search dominates smartphone usage. 70% use their smartphones to search, making search engines the most popular websites visited on smartphones. 80% average daily search in Spanish on an English interface va 20% on a Spanish interface which means they’ve made a choice to be on that spanish site. It also allows for bilingual marketing. Test across languages. you can test serving English content to spanish queries. Pricing on spanish language queries is very low for AdWords. YoY growth on Spanish queries, and intent to purchase are on the rise. Notes from the Q&A: Yes, US Hispanics have broadband access. It is only slightly lower than the general population. Consider segmenting. What do you have to do different for different markets? Concentrate on the nuances that go beyond language. It’s not just Spanish versus English. Music, culture, sports are all part of who the customer is. It’s not just Spanish language or English language. Manzano: When they started producing Portuguese content in Brazil, they started getting a lot of visitors from China. If you’re Chinese, Brazil is the “Made in China”. The Chinese are very interested in Latin America. Social media habits of Latinos? Lopez: It’s a way to consume media. YouTube is really social video. There is more commenting and sharing in the Latino market than the general market. Social is really changing the media consumption from one to one to social in real time. Don’t focus on a specific network, focus on the cultural tendencies toward expression. Lima: We do things in a social manner. We went to buy a washer and we took the whole family. Orkut is a phenomenon in Brazil. Facebook is growing in Brazil, Columbia is number 6 in terms of absolute usage. Manzano: You must use a professional to prepare your content. Most of the Spanish translations he sees make him want to cry. Where do we go to learn about how to get into the Latino market? Lopez: Content localization but don’t wait to have your website perfect. You can drive traffic to an English language site from a thin localized site. Susan, I agree with you where were the Bagels? But you have to admit that lunch desserts were amazing. I heard SES NY was accepting audience feedback, perhaps for next year they can add Bagels ;) On a more serious note, I was sitting on the front row ready for Mark López presentation. I, too, wish it was longer. It didn’t surprise me that ColOmbia ranked so high on being Facebook users. Very interesting takeaways from the Latino track. Thanks for sharing.